Come help celebrate Ridgefield’s proud past, prosperous present and promising future! Vendor spaces are still available for “Experience Ridgefield” hosted by the Ridgefield School District. 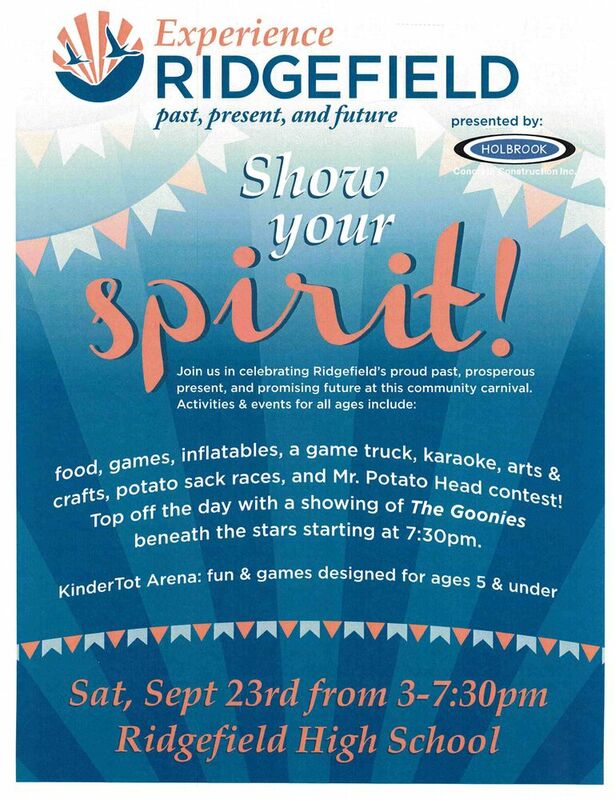 The community carnival, now in its second year, is scheduled for Saturday, September 23 at Ridgefield High School from 3:00 – 7:30 pm. Click here for a Vendor Application and more information. All vendor applications are due September 1. Applications received by August 23 will be entered into a prize drawing. For more information, please call Bonnie Harris at 360-619-1302 or email experience@ridgefieldsd.org or bonnie.harris@ridgefieldsd.org.